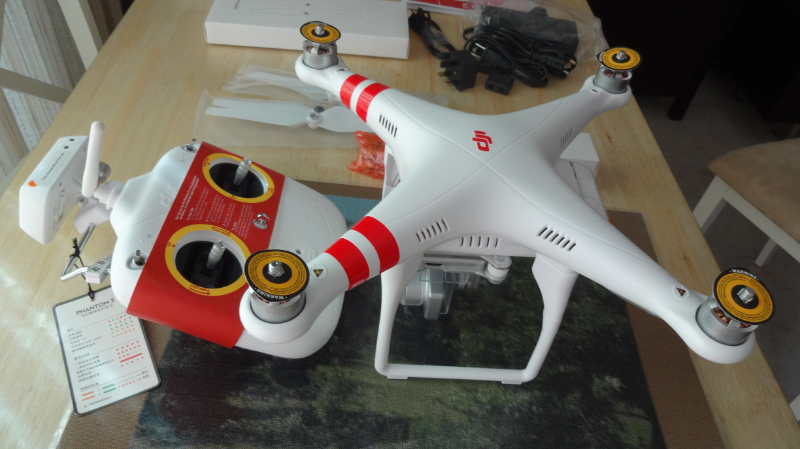 A few weeks ago I posted that I had ordered a dji Phantom 2 Vision+ quad-copter. It arrived a couple of weeks ago. I went into this knowing that it was going to be a long term hobby for me. To begin with, quad-copters that can carry a camera are not cheap. I am going to need a lot of practice to become proficient at flying mine. Based on what I have read and videos I have watched, there will be crashes along the way. Hopefully, by learning as much as I can, practicing and taking things a step at a time, mine will be in the category of rough landings. There are videos and horror stories about these aircraft crashing, and literally flying away never to be seen again for any number of reasons. Back to my experiences so far. It took me about a week and a half to get my first flight off. The dji Phantom I bought is basically ready to fly out of the box, but like most things I do, it proved to be a little harder for me. It is a multi-component system including the quad-copter itself, its camera, the remote control unit, range extender, and the real-time video display, which in my case is my iPhone with the appropriate app. I had to update firmware on two different systems inside the quad and the RC unit etc. Doing that and studying the manuals and videos enough to convince myself I would not crash the first time up, took some time. When the day came to make my first flight, I pre-flighted my Phantom, went to start the motors and nothing happened. After multiple run-throughs of my checklist, still not motors. Fortunately for me, I live close to a hobby store that services Phantoms. I took my Phantom in and in two minutes they had my motors using using the exact steps I had tried, except inside the store there was no GPS lock. I even got them going in the store myself. Feeling somewhat embarrassed I went home and started the motors up in my backyard. Again there was no GPS lock, because our neighbors have some very large trees that overhang into our yard. hat did not bother me, because I had been able to get GPS lock when I originally tried to make my first flight. So, the next day, I again took the Phantom out for its maiden flight. Finding a large enough area where I could perform my first flight without be hampered by spectators was somewhat of a challenge. Soccer is in full swing now and there always seems to be teams practicing. After some driving around I found a suitable site. I Went through the pre-flight checklist, including calibrating the compass and acquiring the satellites,and then attempted to start the motors for takeoff – nothing! Now I’m really baffled. I was too embarrassed to go back to the hobby store (that was my Plan B at this point), so began analyzing the details of what I was doing, watched more videos, and got tips and hints from user forums on the internet. To make this already long post shorter, my problem was that my motors would not start if the Phantom had sufficiently locked into a sufficient number of satellites to fly in the GPS mode, which is encouraged for beginners like me. Determining just why that was so took more studying and seeking out help. Locking onto the GPS, was the common denominator. The motors would not start if GPS lock was obtained. As it turns out, after updating the firmware on something called the IMU in the Phantom, I needed to also recalibrate the IMU. I missed that memo. So I finally got in my first set of flights. I took off and landed about three times during the 20 minutes or so the fully charged battery allows. I did get some video during those flights, but it doesn’t look very impressive even for a first flight. The video clip below is from the couple flights I got in on my second fully-charged batteries. I flew out of the old Miraleste Intermediate School that overlooks the Los Angeles Harbor and San Pedro. The technical quality of the video is really quite good. The jerkiness comes from me controlling the Phantom. When I let it hover on its own, even though it is moving about due to the breeze, the video is exceptionally stable, as you can see. Only when I somewhat manhandle the controls does it jump around a bit. Well that’s all for now, Look for future posts as I get better at flying and learning how to take better videos and photographs. Please don’t hesitate to leave any comments or questions you may have, and share any videos/photos you have taken with your quad-copter. Those of you that of taken my classes, know that I like to use various techniques to make the skies better than they were when I took the photo. And in this post I’m going to explain one of the simplest ways. The results are often quite good when applied to the right photo. The example here is of the old Nike site in Palos Verdes. You can see it was a very gray day. Here are the steps I did in Photoshop Elements to go from the gray skies to something that looks like I probably took the photo in middle of a day sunny day. Since it’s a RAW image, I opened in Adobe Camera Raw, adjusted Contrast, Clarity and the Vibrance a bit to make the foreground have a bit more snap. I then opened it in the Expert Editor workspace in Photoshop Elements. I then selected the sky using the Quick Selection Brush, which was quite easy since the sky is such a uniform gray. I copied the Sky to its own layer using Ctrl+J. I Ctrl-Clicked on the sky thumbnail in the layers palette so that I could get back to arching ants. I selected the selected a suitable color of light blue from the color swatch at the bottom of the Toolbox. I added a layer mask to the sky layer. This had the foreground masked out – painted black. I selected the Linear Gradient Tool with the gradient going from black to white. With the shift key held down and making sure the mask was selected on the active sky layer, I dragged the mouse from the top of the image to the bottom. This gave me the effect that I wanted for the sky. I then flattened image, so I could save it as a JPEG. One of the classes I’m teaching this fall at Torrance is Photoshop CS5 and Camera RAW. The video here is a preview of how the class will work and what we will be covering. Even though CS5 is not the latest version of Photoshop, it still has some very powerful photo editing tools and provides a great foundation for learning the basics of the program. The class starts on Thursday, September 11th from 5:30-7:30 pm. I hope to see you in class. Also, if you have not filled out the survey I posted, please do. It will give me a good idea of just what classes you would be interested in taking, either in a classroom environment or online. Thanks so much.